Elgin Sweepers have been cleaning America’s roadways since 1914. Today, Elgin equipment utilizes every variation of current sweeping technology — mechanical, pure vacuum sweepers, regenerative air, alternative fuel sweepers, waterless dust control and high efficiency filtration — to offer customers the sweeper that best matches their needs. From general street maintenance to special industrial and airport applications, even race track maintenance, Elgin offers an extensive line-up of sweepers to meet highly specialized requirements. Maximum Uptime and Quick Service — it’s what you expect in a sweeper and it’s what drives the Elgin staff. Elgin Sweeper’s extensive dealer network has over 70 dealers with service centers worldwide. These dealerships are staffed with factory-trained, highly- experienced service technicians, and stocked with the necessary street sweeper parts to make repairs and adjustments quickly and efficiently. Their goal is to achieve total customer satisfaction by providing high quality, quick response service to keep you up and running. To assist the users and maintenance managers who work with Elgin Sweepers on a daily basis, the company offers hands on and in-classroom training courses. Service, repair and maintenance of various Elgin sweeper models are the focus of this technician training. All levels are welcome from beginner technician to seasoned mechanic. From the moment you invest in an Elgin Sweeper you expect it to work when and where you need it. Every new Elgin street sweeper is backed by a one-year factory warranty and comes with an operator’s manual and replacement parts book for quick, easy reference as well as the appropriate engine operator’s and parts manual. Customers can select from multiple extended warranty options depending on their unique needs. Elgin Sweepers help the track operators return to green flag racing as quickly and efficiently as possible. 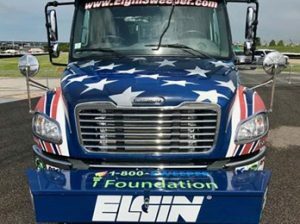 As the Official Sweeper of NASCAR Green, Elgin’s Sweepers are present at each NASCAR race event to support NASCAR’s Air Titan equipment to dry rain-soaked racetracks. Elgin Crosswind Specialty Track Sweepers were designed exclusively for track sweeping and are used for removal of oil absorbent material that has been put down to remove a spill or to assist in the drying of a wet area of the track. Elgin’s relationship with NASCAR now extends to the sweeping companies that form the Member/Partnership under the umbrella of the 1-800-SWEEPER alliance. These companies now have the unique opportunity to entertain customers, employees or even family members with the unique experience of infield garage passes and track side in-the-pits access for a close-up view of NASCAR’s race day experience. To learn more about taking advantage of the NASCAR opportunities at a race near you, please contact Carolyn Bell. To participate in the Elgin Vendor Partner relationship, upon making a purchase, you must forward all invoices from Elgin or Elgin dealer to rebate@1800sweeper.com. If you have questions regarding the Elgin program or any other program in the Buying Group please contact Andy Williams.